Allows to load and read audio files (*.wav, *.mp3, *.xm, *.s3m, etc). Allows to quickly build a textured box. Management of the camera (or of the cameras). All that relates to the scene visualization (fields of view, displacement mode and sensitivity, displacement limits in the 3D scene, etc) is handled by this node. Allows to plot any 3d curve. Most of the job is done with LUA scripting code. Text management in screen coordinates (2d text) or in scene coordinates (3d text). TrueType fonts loading. This node is a small reference mark with 3 axis, which does not have a proper physical representation. If its rendering is activated (render_state), one will see 3 small oriented axis, symbolizing a reference mark. It is used for example with the particles systems (disabling the gizmo rendering that makes the gizmo invisivible, which simulates a source of particles emission...). This node allows to define which key will be a hotkey (key launching a specific action). Allows to assign the launching of any LUA script (assuming that it is already written and saved) on one of the 12 keys defined on the keyboard. This node allows to create HUDs or Head Up Display. Allows to include other source codes within the same file. Allows to make modular programming by dispatching the complete source code of a project between several source files of smaller size. Management of the lights, with all the adjustment possibilities using several attributes. This node gives all its value to a scene, since the objects (their materials and textures) react according to lighting. Allows to create any material, by specifying its properties (reflexion factors, opacity, etc) in order to apply it on imported models (their submeshes) or on meshes directly created in Demoniak3D (cf. the node). By choosing the appropriate values of these parameters, one can obtain some transparency or an increased reflexion effect, etc. It is one of the fundamental nodes (with model, light and camera) since it allows the visual representation of any type of 3d shape: starting from the basic shapes generated in Demoniak3D (plane, torus, sphere or ground) to complex shapes created with modeling softwares such as 3d Studio MAX. The mesh is for example the only object of the scene on which bumpmapping or picking can apply. It is one of the fundamental nodes (with mesh, light and camera) since it allows loading of 3d models from files on the hard drive. The model is a mesh collection. Allows to specify a motion path intended to be followed by objects (model, cameras, etc). By specifying the key positions and the corresponding tangents, Demoniak3D will calculate by interpolation all the intermediate positions. Allows to integrate a particles system. It is in such a node that are defined the number of particles to be used and their texture, the particles transmitters nodes, actions specific to particles as well as the particles obstacles nodes. Allows to specify preset actions on the particles, like a speed variation, a color variation, gravity, a point of attraction, etc. Allows to specify the characteristics of a particles transmitter (basic shape, type of emission, particles lifetime, etc). Allows to set up obstacles in order to deviate the particles from their trajectory. Allows to gather within the same list, several audio tracks in order to create a playlist like in the Winamp software. Of course, Demoniak3D goes further than a simple tracks sequential reading: it allows to link scripts with each audio track. This node is a development tool only. It makes it possible to define the usual basic primitive shapes (plan, disc, sphere) only to visualize the position of certain objects that will be integrated afterwards. These shapes will not be taken into account in the objects reflexion (or transparency etc.) algorithms. It is just a plus provided by Demoniak3D to help building the 3D environment. 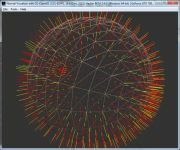 Allows to describe the basic elements of the 3d scene, such as the rendering window size, the background color, the name of the author, the activation of the objects picking module or the screenshot option, etc. Allows to integrate LUA scripts especially written to interact with the objects of the 3d scene. Allows to integrate some scripts written in OpenGL Shading Language (GLSL). This node allows to include skyboxes and to quickly create realistic environments. Allows to import image files (*.bmp, *.jpg, *.tif, *.png, *.tga, ...) to be applied as textures on the various objects (mainly meshes). Allows to create timer which performs LUA scripts with fixed time intervals. Page generated in 0.0029160976409912 seconds.